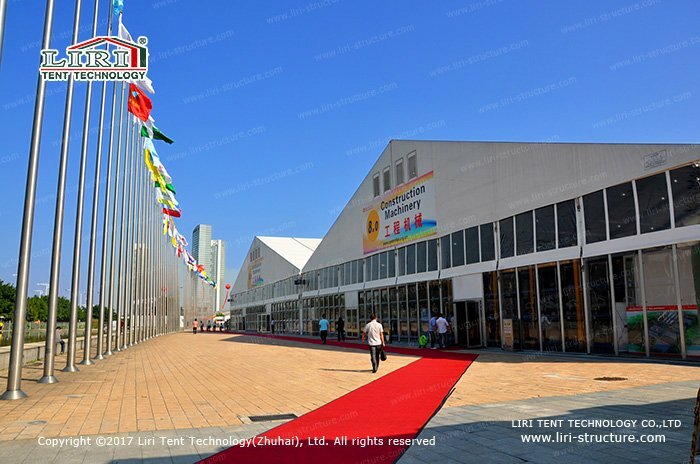 During the period from September to October 2018, LIRI TENT company ushered in its annual peak hour of construction. The company threw itself entirely into the busy construction stage. During this short period of 2 months, our construction team spread their footprint all over the country and completed more than 80 projects with the total construction area more than 300,000 square meters. With multiple high degrees, construction difficulty projects carried out at the same time, it is a severe test for the company’s strength. With the success closing ceremony of 2018 Airshow China in Zhuhai city on 11th November 2018, about 80,000sqm airshow tent are being dismantled intensively. The exhibition area of this show is so big and it made the largest one among history. 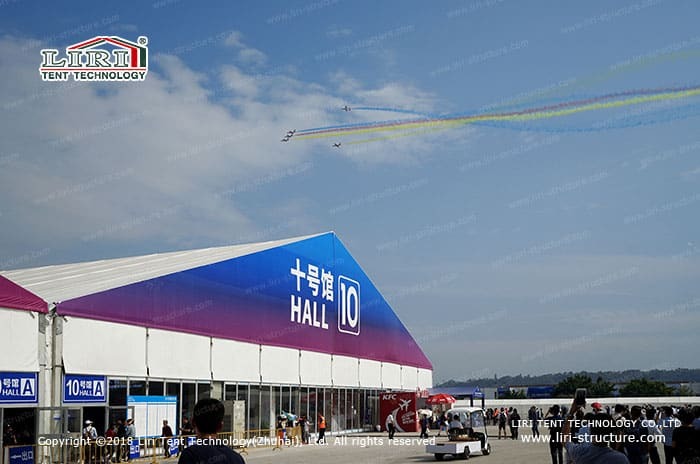 Through the solidarity and cooperation of all the construction personnel and their unremitting efforts, we successfully escorted the smooth opening of the airshow, and the 14 sets of exhibition tents were neatly and orderly distributed in each gate area. 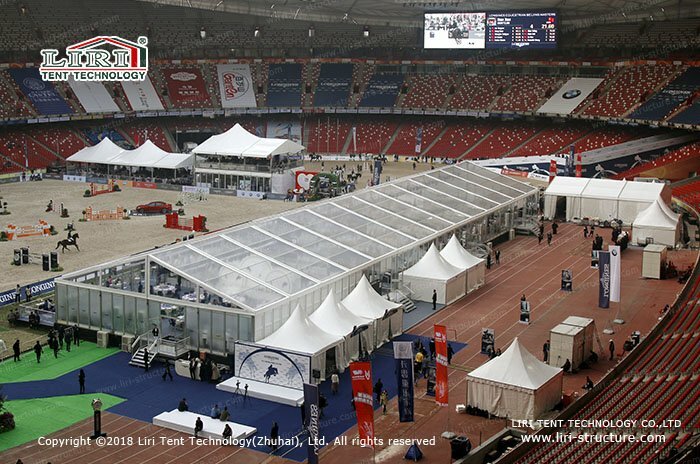 Before the opening, and as the assault support for the show, LIRI TENT assembled nearly 300 people, various material resources and all kinds of large mechanical equipment to help on site with the installation. The construction difficulty of the project is very big and the B restaurant impressed us most. Because there are rows of small trees on the ground for the B restaurant and the tent can not be built directly. It is hard and a big challenge to set up the tent when you want to in line with the concept of protecting the environment. However, through the close coordination of the engineering and technology, we planned and carefully and completed the difficult task. On September 30th, 2018, five “special forces soldiers” from LIRI TENT who are the response for the installation of a special hotel tent project, were sent to Ganzi Tibetan autonomous prefecture in Sichuan province with a high altitude of 4,000 meters. The environment was so bad, but our people faced the challenge and tackled it. Without any mechanical assistance, our construction team dug out the installation materials buried deep down in the snow with bare hands and built the hotel tent perfectly on the high mountain relying on manpower only, showing lirier’s spirit of perseverance and challenging the limit. The Canton Fair exhibition is divided into three phases, and so is the construction of the exhibition tent. And among which, the second phase owns the largest construction volume and the highest installation difficulty. The second phase will start immediately right after the first phase, which gives us only the fixed timing from 7 PM to 6 o ‘clock in the morning. With more than 8,000sqm tent must be installed in due time, there is not much option left for us but carrying out all night raid. However, such an urgent work with a high-level difficulty is not doubted a dual test for our people’s body and mind. in the race against time with such a large construction volume, our team were well arranged accordingly and we won the race. Speaking of difficulty, this year’s sports event marquees for international equestrian Beijing Master makes no exception. 3 days and 2 nights of short construction time and strict on-site requirements have increased the difficulty greatly. 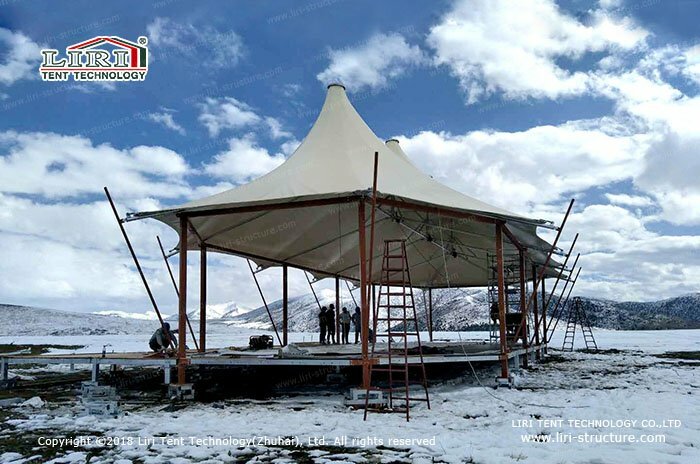 Totally more than 7000 square meters event marquee tent is to be installed. On one side, we have to install the tent while unloading the materials. On the other side, we have to protect the site in all aspects and avoid any possible damage to the national sports venue. This is more a test to our ability and management, not to mention that the installation coincided with the dismantle of another project, the Sing China Finals. During the overnight working period, with all the time pressure, we almost keep up with the “kicking our heels “rhythm. Only with firm faith and indomitable spirit, as well as the full cooperation and efforts of our team, that can we complete so many difficult projects in such a short time. Now our tents can be seen all over the world and such achievement cannot be done with all lirier’s efforts, which we are always proud of.